What is Stroke: A stroke or “brain attack” occurs when a blood clot blocks the blood flow in a vessel or artery or when a blood vessel breaks. There are two types of “brain attacks” — ischemic and hemorrhagic. When brain cells die during a stroke, abilities controlled by that area of the brain are lost. These abilities include speech, movement and memory. How a stroke patient is affected depends on where the stroke occurs in the brain and how much the brain is damaged. 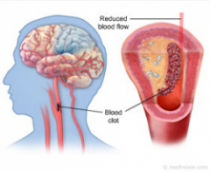 With ischemic strokes, a blood clot blocks or “plugs” a blood vessel in the brain. Limited treatments are tPA “clot buster” or surgical removal of the clot within a 2-3h time-window (and sometimes up to 6h). An estimated 7,000,000 Americans 20 years of age have had a stroke. Overall stroke prevalence during this period is an estimated 3.0%. The prevalence of silent cerebral infarction between 55 and 64 years of age is ~11%. This prevalence increases to 22% between 65 and 69 years of age, 28% between 70 and 74 years of age, 32% between 75 and 79 years of age, 40% between 80 and 85 years of age, and 43% at 85 years of age. Application of these rates to 1998 US population estimates results in an estimated 13 million people with prevalent silent stroke every year. Silent stroke may be important in the development of AD since cerebral perfusion isoften found to be reduced in association with an increased oxygen extraction fraction during an attack, a hemodynamic presentation typically found in AD patients. For the incidence, it is estimated that each year, ~795 000 people experience a new or recurrent stroke. From 1999 data, approximately 610,000 of these are first attacks, and 185 000 are recurrent attacks). On average, every 40 seconds, someone in the US has a stroke. On average, every 4 minutes, someone dies of a stroke. Stroke accounted for ~1 of every 18 deaths in the United States in 2007. It now appears that coronary artery bypass grafting (CABG) surgery may induce cognitive loss in as many as 50% of patients undergoing this procedure. The number of TIAs in the United States has been estimated to be ~200,000 to 500,000 per year, with a population prevalence into ~5 million people. The prevalence of TIA increases significantly with older age. Approximately half of all patients who experience a TIA fail to report it to their healthcare providers. 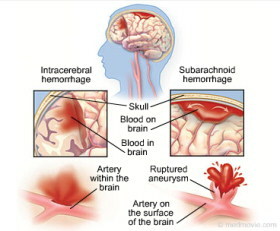 With hemorrhagic strokes, a blood vessel in the brain breaks or ruptures.The occurrence rate of ischemic stroke is ~83% and for hemorrhagic it is ~17%. Among people 45 to 64 years of age, approximately 8% to 12% of ischemic strokes and 37% to 38% of hemorrhagic strokes result in death within 30 days. In a study of people 65 years of age recruited from a random sample of Health Care Financing Administration Medicare Part B eligibility lists in four US communities, the 1-month case fatality rate was 12.6% for all strokes, 8.1% for ischemic strokes, and 44.6% for hemorrhagic strokes. Approximately half of incident childhood strokes are hemorrhagic. Despite current treatment, 1 of 10 children with ischemic or hemorrhagic stroke will have a recurrence within 5 years. National Institute of Neurological Disorders and Stroke (NINDS): NINDS is a federal agency that conducts and supports research on the causes, prevention, diagnosis, and treatment of neurological disorders and stroke. Its web site includes authoritative information for consumers, as well as current research and research opportunities.